If you have ever tried to remove wallpaper, especially if it was installed more than 10 years ago, you know this is a much more labor intensive task than it would seem. 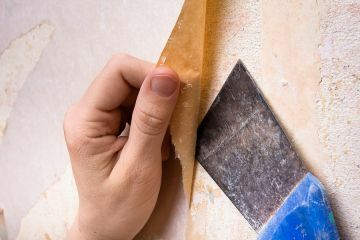 Often, when the wallpaper is removed, it either comes off in tiny tears, or chunks of drywall come off right along with it! If you have attempted to remove your own wallpaper and have decided to give up, give Palmer Pro a call to get it done for you! When you call Palmer Pro to remove wallpaper from the interior surfaces of your home or office, we'll arrive quickly and give you a fair, written quote. Should you select us to complete the job, we'll come back in a timely manner that best suits your busy schedule, and gets the job done efficiently and completely. We can even patch holes and imperfections, and the surface smooth and repaint for you. Palmer Pro has been in the painting business since 2015. Over the years, we have become a local favorite for getting work done on time and adhering to your budget. Wallpaper removal is no exception. It's one of the many painting related services we provide to homeowners and businesses, and one that we do well. Give us a call at (832) 410-1868 and we'll get that old wallpaper taken off and give your interior rooms a fresh new look! If your interior rooms are looking dated, one of the most economical measures you can take is to remove your wallpaper! Wallpaper can really date a home. Ask us to bring along some paint sample palates and we'll help you choose fresh, popular colors that will enhance the beauty of your home and set a welcoming mood.